Ajoupa 11 is a two-storey spacious villa with shared swimming pool set in landscaped well maintained tropical gardens within a small complex of 14 villas. The villa is ideally located and is in easy walking distance to beaches, supermarket, restaurants. The entire villa is air-conditioned, ceiling fans. WIFI, TV, DVD & telephone (local calls). There is a sun terrace at the front of the villa & leading from the main bedroom a sun terrace/balcony with ocean view. 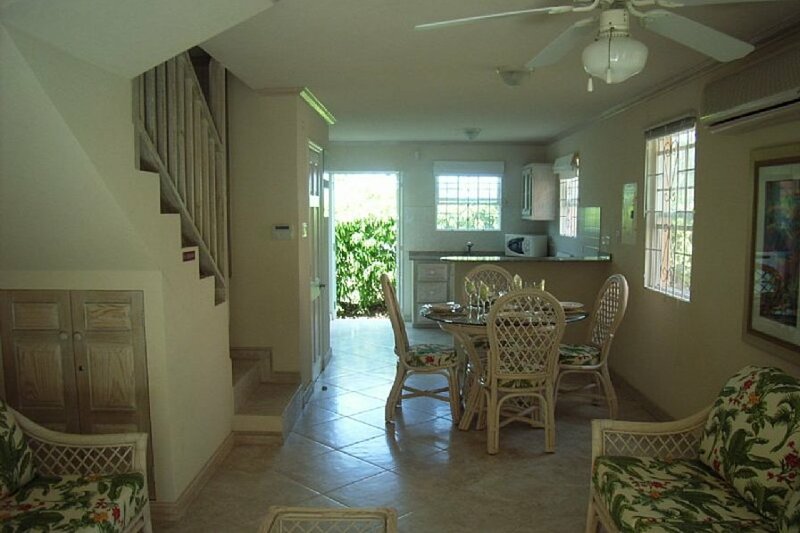 Upstairs the main bedroom with double doors leading to a balcony which has views of the Caribbean Sea with ceiling fan, air-conditioning, double size bed & large fitted wardrobes. The 2nd bedroom has 2 single beds and a large fitted wardrobe, ceiling fan and air-conditioning. The large bathroom with bath and shower, vanity unit, low level WC. Downstairs an additional cloakroom. The lower floor is a modern open plan Lounge with TV & separate DVD player, leading to the dining area. A well equipped fully fitted kitchen with breakfast bar & work surfaces, washing machine, tumble dryer, fridge/freezer, cooker and microwave. The kitchen back door opens to a garden area. Private parking area with illuminated pathway through the gardens leading to sun bathing patio area & pool. Location: Ajoupa 11 is situated in Fitts Village, a small fishing village on the West Coast of Barbados. Fitts Village has its own wonderful sandy beach, supermarket & restaurants and is within easy access into Holetown and Bridgetown. The villa is ideally located for exploring the West Coast and is within easy walking distance to local amenities. If you prefer not to hire a car, bus stops are within easy walking distance along the coast road, 5 mins walk from the villa. Shopping required for arrival can be arranged, please enquire. Beach towels are not provided.